And I can assure you that, from the moment it is in the pot to the one in which it disappears from the plate, it is a moment. The last time I put on the table this preparation I had to force myself to eat slowly and savor every bite. What else can I add: try it and you will be amazed! Let's see how to prepare starting, as always, from the ingredients. Clean the asparagus and discard the last centimeter of the stems. Prepare the asparagus restricted for the sauce: cut the final third of the stems into rounds and reduce on low heat along with broth, wine, sugar, salt and lemon juice. While the pasta cooks, cut the rest of the asparagus into two or three parts (depending on the size) and keep them aside for the next cooking. whip and pass it through a sieve. and meanwhile prepare the sauce to tie it all. just golden add the cream, mix and finish with small asparagus. 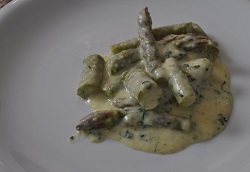 Mix the steamed asparagus with the cream together with one or two handfuls of coarsely chopped chervil. Blend the flavors and serve. In this case the asparagus ragout was served together with new potatoes cooked in wedges in the oven and with fillets of plaice briefly browned in butter. 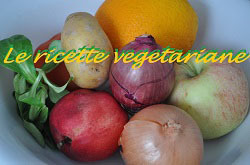 It can also be served alone, on croutons of bread or polenta or as an accompaniment to grilled meats.